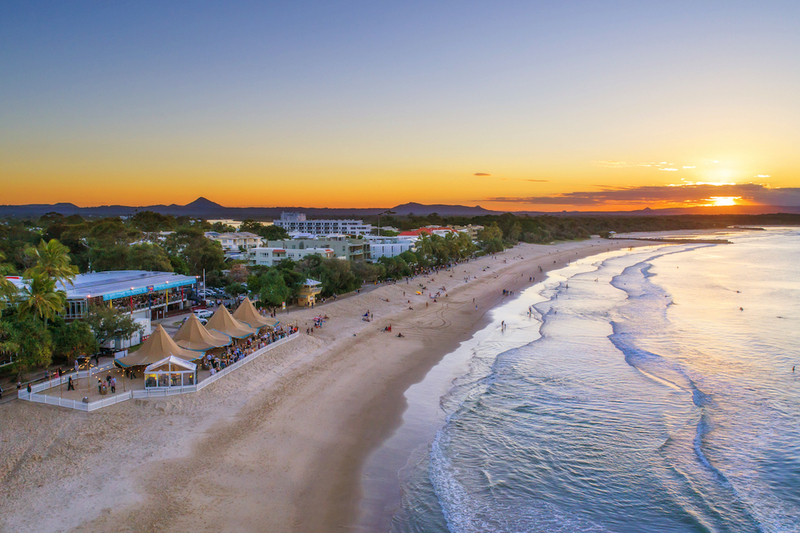 Beach, river and hinterland form a backdrop for the Noosa Food & Wine Festival. It was always Scott Montague’s passion to own a VW Kombi so when he got married he bought one to use for his wedding. But old Kombi’s are expensive. The going rate these days is about $70,000 – who would have thought? So, a year after he bought his 1966 Kombi, fondly named Evie, he started a chauffeuring service to pay for his indulgence. 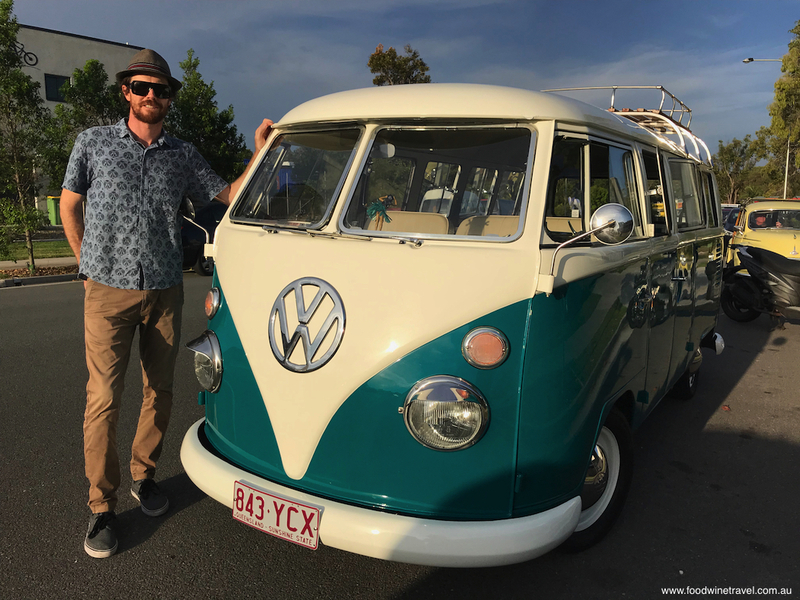 Old Skool Kombis now ferries guests around Noosa and the Sunshine Coast for weddings, tours and events – any occasion really – and that’s how I come to be riding in Scott’s precious baby on a balmy Noosa evening. Along with a couple of other food and travel writers, I’m being given a taste of the upcoming Noosa Food & Wine Festival, one of Australia’s leading food festivals for the sheer breadth of experiences on offer and the calibre of chefs it attracts. Scott Montague ferries people around Noosa in his Old Skool Kombi. Now in its 16th year, and having undergone various incarnations over that time, it features a veritable who’s who of Australia’s culinary talent. This is one festival that doesn’t have to work hard to attracts chefs – they practically fall over themselves to be there, such is the camaraderie and commitment it inspires. 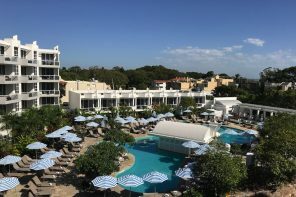 This year’s festival will be held over five mouth-watering days from May 16 to 20, and as always, there’ll be a fantastic line-up of beachfront brunches, special dinners, cooking demonstrations, and partying under the stars. This year’s program sees the addition of a few new events and some tweaking of old favourites. Think black-tie dining in Hastings Street with Champagne flowing, and a Well Nourished brunch to remind you not to overdo things. But more about that later. 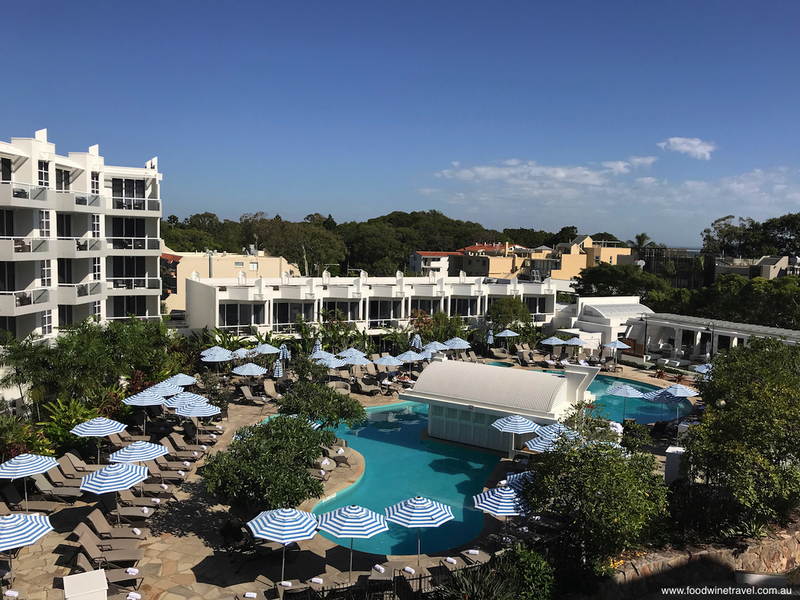 The Sofitel Noosa Pacific Resort: accommodation in the heart of Noosa. 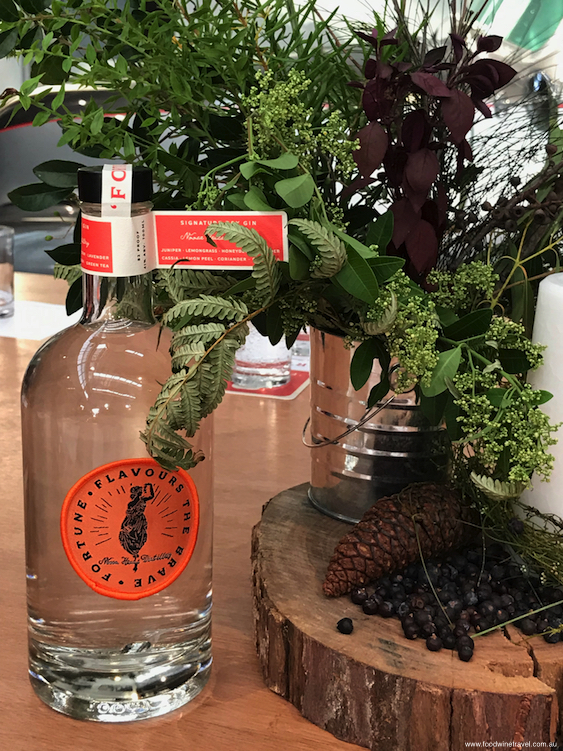 Fortune’s Signature Dry Gin: Fortune flavours the brave. The adjacent brewery has been open for a little over a year and has already proved incredibly popular with its craft beers and good food, some of which we are given a taste of at the distillery launch. There are oysters with a red wine vinaigrette, served on a bed of spent grain; pork bao buns; Vodka-cured salmon gravlax on blinis; and some amazing Negroni-cured tuna tartare served in dainty green tea cones, a morsel of such exquisite beauty and deliciousness that I struggle to focus on the task at hand. But Tim is keen to tell us all about his new venture and to introduce us to his head brewer, Shane Fairweather, and his head distiller, Jackson Boyd. Tim Crabtree, left, and his head brewer, Shane Fairweather. “I saw a gap in the market for a lifestyle-based brewery,” says Tim. “I live in Noosa. It’s a beautiful part of the world. You’ve had this great day at the beach, and nothing sets it off like a beautiful refreshing beer.” Add to that a gin flavoured with North Queensland honeydew melon, vodka filtered through coconut husks, and a white malt that uses some of the base material from the beers, and Fortune really does flavour the brave. 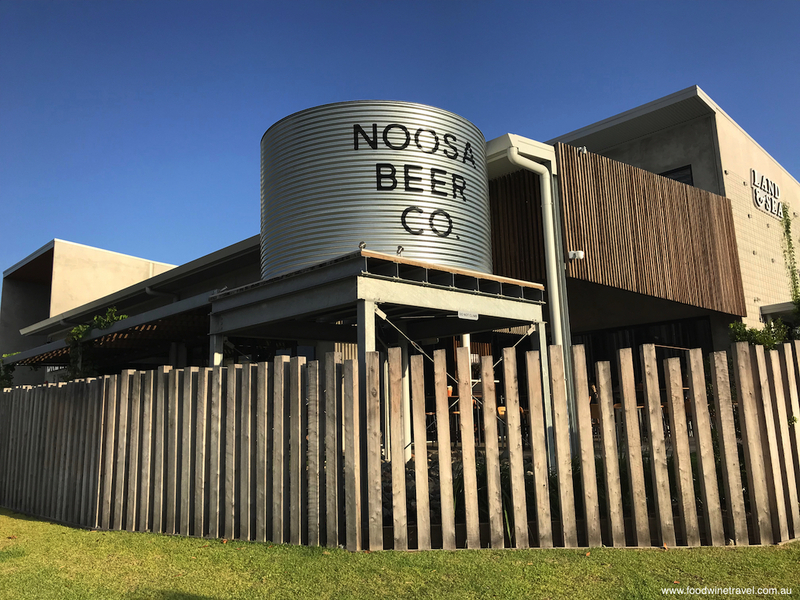 The Noosa Heads Distillery has opened adjacent to the Land & Sea Brewery. So good are the canapés that it’s hard to think of dinner but next we’re off in the Kombi to Locale, a restaurant in Hastings Street with a fabulous produce-driven menu, great cocktails and wines, and a feel-good vibe. The food is Italian-inspired so it calls for nothing less than an Aperol Spritz, which goes down a treat with the Fraser Island spanner crab risotto and the burrata served with prosciutto and figs. I’m super impressed with Locale’s approach to sustainability whereby it sources produce from its own property, Maravista Farm, in the Noosa Hinterland, and returns all its food waste to the farm for compost. Sustainability is a core focus for the festival, as we discover over breakfast the next morning with festival director Sheridah Puttick. The Festival Village uses biodegradable cutlery and plates, encourages reusable water bottles, and recycles all leftover food. 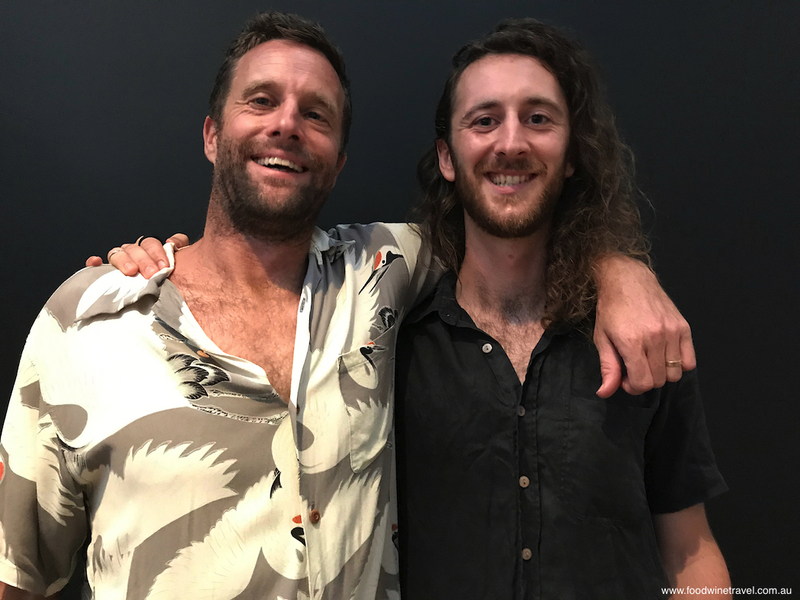 One session each day will be about food waste, while an industry day that’s being held on the Monday will include a brunch for 100 people that OzHarvest ambassador Cameron Mathews will create using leftover produce. 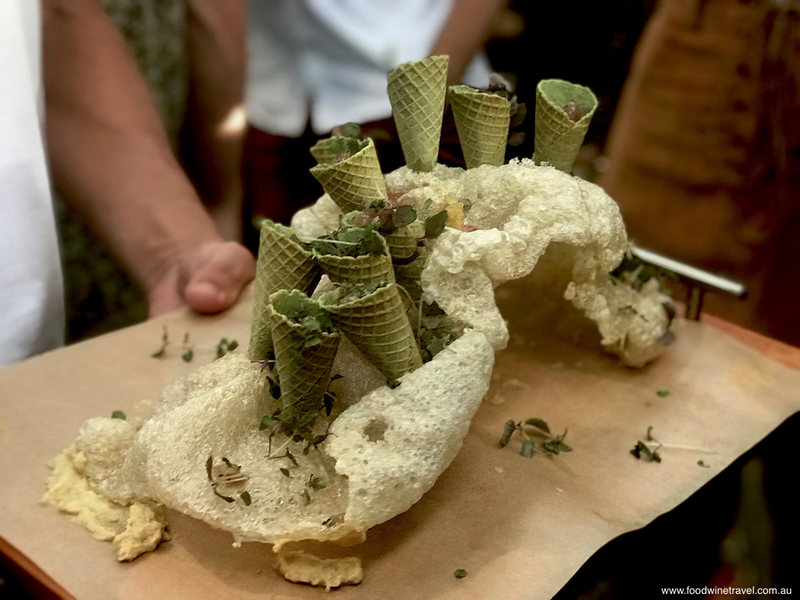 Negroni-cured tuna tartare served in green tea cones, at Noosa Heads Distillery. We’re meeting with Sheridah in the Sofitel’s signature restaurant, Noosa Beach House Peter Kuruvita, which will team up with Locale for the black-tie dinner in Hastings Street on the Saturday night. Celebrating the 150th anniversary of Moët & Chandon’s Impérial Moët Champagne, Noir Noosa is being billed as an “elegant fusion of glamorous and theatrical celebration, French-inspired cuisine and free-flowing Champagne”. One of the sessions in the Drinks Lab is Wines of the World, featuring labels that a lot of people will be unfamiliar with, from Turkey, Croatia, India, South Africa and so on. The festival’s long lunch in Hastings Street is always a sell-out event. In a premium spot in the Festival Village, down by the Noosa River, River Lounge is a food and beverage experience offering 2-hour all-inclusive packages for $75. Each will have its own theme and cater for around 70 people at the most. Momofuku chef Paul Carmichael, for example, will do Caribbean-style food to accompany Caribbean-style cocktails and reggae beats; Jesse McTavish from North Bondi Fish will do a seafood menu; and the team from Bali’s uber-cool Bikini restaurant will do a session that Sheridah says will be theatrical and “a bit cheeky”. Many Noosa restaurants are organizing their own special events during the festival, but there are a few additional events that Sheridah is keen to tell us about. Continuing with the local and sustainable theme, Well Nourished will be a yummy brunch on Noosa Main Beach on the Sunday morning. Using organic, ethically sourced products, it will feature Bloody Mary’s made with local heirloom tomatoes, and food that sounds more hedonistic than healthy, like sausage rolls and chocolate slice. But they’re all made from healthy, good ingredients – promise. Two exciting lunches will be held in the Noosa Hinterland. The Underground Collective on the Friday features Alla Wolf-Tasker and Matt Moran, amongst others, and will highlight small-scale producers. Modern Australia on the Saturday will be MC’d by Jock Zonfrillo and will focus on wild and native foraged ingredients. Art-O-Matic Riding High, one of the works in the Peter Phillips Gallery which will open for the first time during the Noosa Food & Wine Festival. After breakfast, our trusty Kombi driver is waiting to take us up into the hills to the Peter Phillips Gallery which houses the private collection of the British pop artist who has chosen Noosa as his home. Sadly, Phillips is recovering from a stint in hospital and we don’t get to meet him, but his daughter Zoe puts out the welcome mat and tell us all about their plans for the festival. At POP! on the Saturday, ex-GOMA chef Josh Lopez will serve canapés to go with Fortune’s ‘Navy Strength’ Extra Dry Gin that the Noosa Heads Distillery is producing especially for the event. This Limited Edition Gin will pay tribute to Peter Phillips with labels showcasing six art pieces representing six decades of his work. 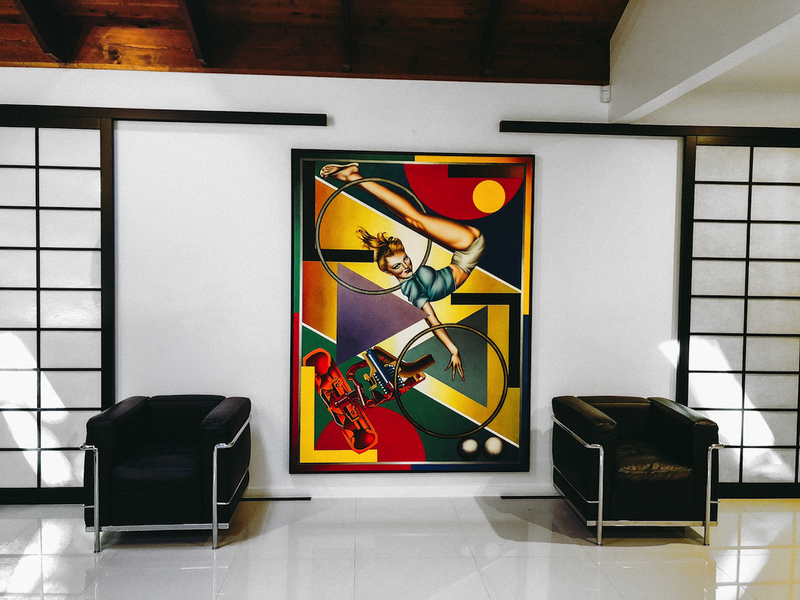 Guests will learn about the history of pop art, meet Phillips, hear stories of his career, watch a short film outdoors and be the first to see Phillips’ retrospective exhibition. 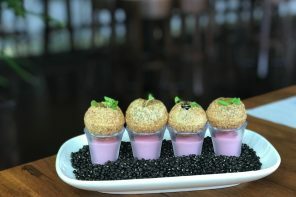 At PROGRESSIVE POP on the Sunday, Lopez will do a six-course degustation menu inspired by Phillips’ six decades of work. Each course will include a wine pairing and there will be limited edition take-away cards signed by the artist. Anyone who tasted Lopez’s chocolate dessert inspired by an Aboriginal painting when he was at GOMA will know what an extraordinary experience this is likely to be. Guests at both events will take home three pairs of Happy Socks featuring Phillips’ pop art. He’s in illustrious company with this as the hip Swedish sock brand has previously partnered with The Beatles, Andy Warhol and most recently, the Rolling Stones. It’s a pleasure to have the gallery all to ourselves as we preview the exhibition chronicling the 60-year career of this founding figure of the pop art movement. The opportunity for reflection allows me to also reflect on the way Noosa has evolved over the decades I’ve been coming here. As it has transformed into the mecca of sophisticated relaxation that it is today, so too has the festival re-invented itself to remain relevant to those who love their food and wine. 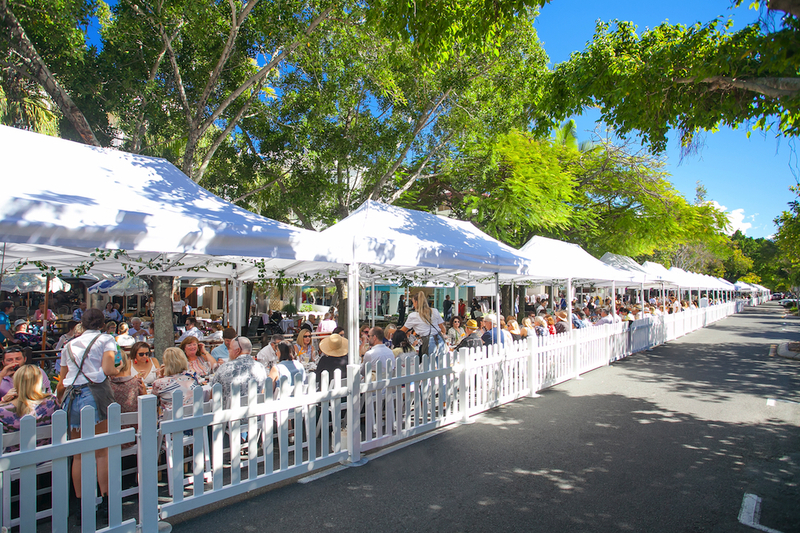 Food Wine Travel was a guest of Tourism Noosa for this preview of the Noosa Food & Wine Festival. We’ll get to this festival one of these days. Such a beautiful part of the world, and such delicious offerings! Australia’s love affair with Sangiovese continues.